On the first day, the fires came without warning. Just a precession right down the middle of main street, hello, hello, I've been looking forward to meeting you. The wind scattered sparks skyward. There wasn't enough time to find the cat who has been stalking butterflies outside. There wasn't enough time to check in with the elderly neighbor who shared photos of their grandkids and loved your pumpkin pie. There was only time for those who could to run. On the second day, the smoke had already traveled hundreds of miles. The nearby towns and cities are choked with grey, including mine. We are told to get P-100 or N-95 masks. We are told not to go outside. We are told to close all the windows. And we are the lucky ones: we still have our bookshelves. Our car tires are not melted to the road. The air is toxic, but we are alive. On the third day, I think about the smoke. It isn't just 'smoke': it is the remnants of melted car tires, burned photo albums of baby pictures, charcoaled couches and guitars and lamps, burned human bodies of people who died in their cars trying to escape. I am breathing them in. They are becoming part of me. On the fifth day, I order reusable N-95 masks online. I have been putting this off thinking that by the time they arrive, the smoke would clear, but the fire is only twenty percent contained. This is the third time I have needed this kind of mask since I moved to California. The fires are becoming a regular occurrence. On the sixth day, the air is the worse it has been yet. I read about the cities whose air quality is always like this. 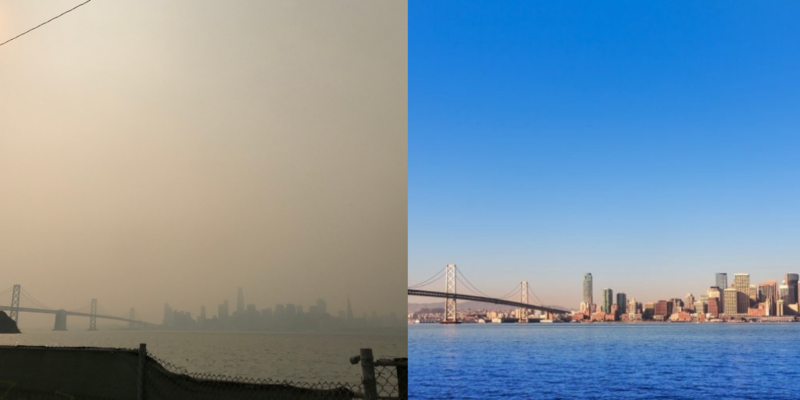 Yes, San Francisco's air is bad: 290. But Dhaka, Bangladesh is 465. Delhi and Mumbai are frequently above 290 on typical days. Kolkata, India is 208. Lahore, Pakistan is 207. What is it like to live with this as a daily reality? On the ninth day, I realize that my bedroom is not at all sealed. The cracks in the windows and doors are completely open to the outside air. I think about sleeping on the couch. On the tenth day, I read that the trees love smoke. Smoke is carbon dioxide, which is what they love to breathe. I read that areas where there are the most trees, the air is the highest quality. On the twelfth day, I read that the air is so bad, it is the equivalent of smoking ten cigarettes a day. As a former smoker, I think, well that actually isn't so bad. On the fourteenth day, the rains finally came. The puddles become full of toxic ash. We are advised not to let the dogs drink from them, but who ever could stop a dog from drinking a puddle? Our deck is slick with the residue. The city glitters and shines, fresh from a bath, and I can see across the Bay again. Every day, I think: Could the earth be any more clear in her message?